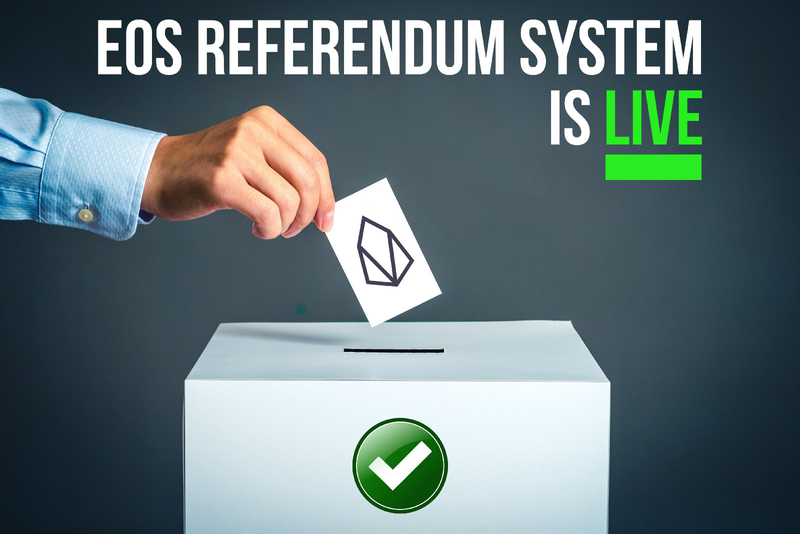 Why does EOS need a referendum system? EOS is a community-governed blockchain. Stakeholders launched it in June using the weight of their tokens to elect 21 Block Producers (BPs) to operate the network. Those BPs are the organizations that run the infrastructure and hold the keys to implement changes to the hard-coded rules that make it all work so magically. They’re held accountable through continuous voting and can be replaced by new organizations at any time. As the network continues to evolve, BPs will be responsible for implementing the changes that make that evolution possible. And that might involve making some tough decisions with severe implications. Beyond the BP elections, there’s currently no sure way to gauge token holder appetite for change. While the mechanism doesn’t exist, article XI of the Constitution makes it clear: token holders have the right to vote for changes to the network directly through a referendum. And that’s where the referendum system comes in. We’re providing the community with a tool to enable EOS token holders to vote on proposals with their staked tokens. 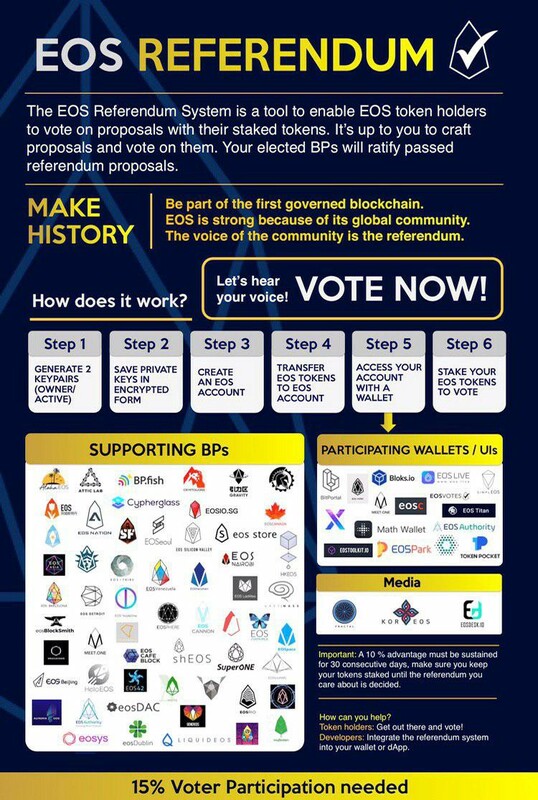 The referendum system is made up of a forum smart contract for submitting proposals and casting votes, a tally system for counting the EOS staked towards each ballot option, a voting portal UI with support documentation to facilitate easy voting, and support for integration with wallets and alternative UIs so token holders can participate in the interface they’re most comfortable with. It’s all open source and available on GitHub. We haven’t developed a process for creating or filtering proposals, nor have we defined any specific rules for how referenda should be ratified. We’ll provide suggested best practices, but we can’t control how the tool will be used, nor do we have the authority to impose our own rules outside of what’s outlined in article XI of the EOS Constitution. It’s up to the community to craft proposals and vote on them, and signatures from at least 15/21 top BPs to ratify and implement passed proposals. Thanks to the beauty of DPOS, a separate group has formed to develop proposal best practices of their own. You can find the Ballot Craft group on telegram. EOS Referendum System is “GO” for *beta* launch!